After yesterday’s incessant seven or eight hours of rain, we were looking forward to today’s promise of dry weather with, dare we say, a bit of sunshine thrown in. 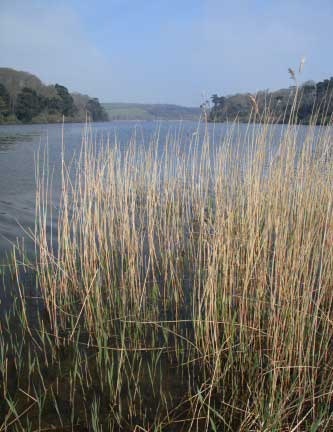 Just southwest of Helston I had seen, on good ol’ Google Earth, a circular walk around a body of fresh water called The Loe. Actually, the main arm is called The Loe with a smaller arm being called Carminowe Creek. It’s about 5 miles around and in the grounds of a National Trust property, Penrose House. The most interesting feature is that this fresh water lake is separated from the sea by a sand bank, Loe Bar, only a hundred yards or so wide. There is another feature which interested us. As well as being a mere spit southwest of Helston, it is a mere spit southeast of Porthleven which is home to a splendid fishmonger. We’d been there before and seen fish so fresh that it was still in rigor mortis. So our plan, such as it was, was to saunter around The Loe, have a gander at Loe Bar making suitable "ooh, ah" noises, then spin into Porthleven and grab fresher fish than we are ever able to buy at home for this evenings gastro-entertainment. Whilst the day itself may have been dry, the ground underfoot was far from dry following yesterday’s soaking, naturally. So, we slipped and slithered our way through various patches of mud around the less-well-drained sections of the walk supported by our Leki poles. The sun did put in an appearance but it was initially something of a half-hearted affair, though Carol did manage to grab a shot of The Loe with some rarely seen blue sky. Shyness had overcome the Sun by the time we reached Loe Bar, though, and it was hiding behind the more familiar grey murk. Porthleven fish shop was again grand, the main difficulty being choice. (Hugh Fearnley-Whittingstall would be proud of us; we chose a megrim which, apparently, suffers from bad PR and is considering re-badging itself as Cornish sole in an attempt to become more appealing to the fish-buying public.) Less grand was the fact that Porthleven appears to lack a half-way reasonable shop to provide the necessary accompaniments for our megrim/Cornish sole, so a brief detour to Penzance Morrisons was called for on the way back. The sun and blue sky returned after our walk, naturally, and very welcome it was, too (he said, as a few spots of rain began hitting the caravan roof). Not to dampen you spirits (no pun intended) but our storm of four days is headed your way, I believe.